Looking for an excuse to kick it in the field, be active and social, or just have something more interesting to do during your time off than checking AQI readings? Well, why not join a team or club in Beijing? Sports teams and athletic clubs are rife around Beijing, so we've rounded up just a few of the best that offer Anglophones and their friends the chance to do something sporty. Find your sport, get in touch and then head to the seemingly one-and-only drinking spot for all teams, ever: Paddy's. What The Beijing International Badminton Club (BIBC) was founded in 2007 by American John Ho. 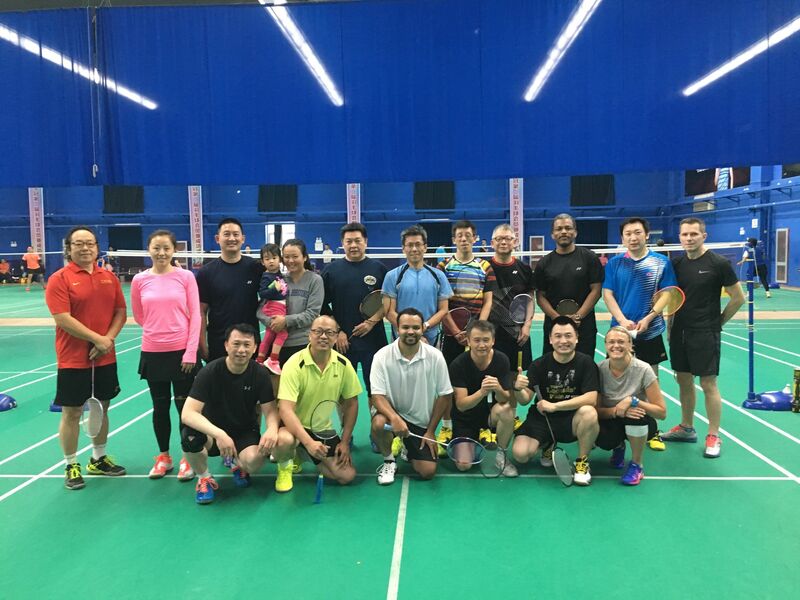 With over a hundred members from all over the world, BIBC is dedicated to creating opportunities for international badminton players to play this racquet sport. Who Everyone can join, though most players are intermediate or advanced players. How If you are interested in joining the team, send either Alina or John an email telling them a little bit about yourself, including what level of player you are. Where/when Training is every Sunday 9am-noon at the Huaguan Yongbo Indoor Badminton Centre, court number 3 and 4. The walk-in fee is 60RMB which covers court rental and shuttlecock use. What Saddle up! Bike polo, the spin-off of the traditional equestrian game, is completely unlike its posh counterpart. Natooke Bike Polo club is a non-competitive sports club perfect for those looking to try out a new sport and have fun while you’re at it. If you can ride a bike and can see, you can definitely play a game of bike polo. It’s challenging and fun without the prohibitive price tag. Who Everyone is welcome to join, and it’s completely free! All you need is a bike, be it your own or one of the rented city bikes. How Simply shoot them a message via the bike shop's Facebook or WeChat (ID: 13601116621) to join. When/where They meet every Tuesday and Thursday, 7-9pm at Worker’s Stadium. What Formed in 2016 over a couple of beers, the Beijing Ducks Cricket Club has been growing every season, recruiting members from all over Beijing and the world. They’ve waddled their way through competitions locally and internationally in Nanjing, the Philippines and Thailand and have even brought home some silverware to display. Who It’s currently an all-male team, but everyone is welcome to join. How To join the Ducks, fill out the form here. When/where Training begins as soon as the weather warms up. They train on Sundays, 12pm at Dulwich College Beijing. And, unsurprisingly, the Ducks can also be found downing a pint at Paddy O’Shea’s on Thursday nights. What Created in 2013, the Megatons are an amateur darts club in Beijing. Oft cited as a drinking club with a darts problem, the Megatons’ darts nights are frequently filled with a lot of fun, banter and drinks. Despite this, they're a massive force to be reckoned with, emerging as champions every year at the Beijing International Darts League. Who Everyone is welcome to join. How Join them at their home turf of Paddy O’Shea’s or add them on WeChat (ID: paddysbeijing). When/where The Megatons play all year round at Paddy O'Shea's. Training is every night except Wednesdays and Saturdays, from 6pm. What First formed in 2002, the Beijing International Dragon Boating team started thanks to a love of this traditional water sport. Organised primarily by captain Polo Helming, this paddling team has since grown and is made up of members of all nationalities, including Australians, Americans, Canadians, Brits and more. Who Everyone is welcome to join, regardless of fitness level. How To join, contact the captain on WeChat (ID: 13501036116). When/where Practices resume after the winter season is over, and the team gathers at 10am every Saturday at the Golden Sail Water Sports Club. Attendees are expected to pay 100RMB for the rental of the boat. Each session is accompanied by segments of personalised coaching, paddling and yoga warm-ups led by the captain himself. What Formed in 2003, the Beijing Bombers are an amateur Australian rules football club that’s committed to developing the game in China. As one of the oldest Australian Football League (AFL) teams in Asia, they have not only competed within Beijing and greater China, but have also played internationally. Their next stops: Shanghai, for the Shanghai Cup, and Thailand, for the Asian Championships. Who Everyone, of any skill level, is welcome to join. (That includes you, footy ladies). How Connect via Facebook to get added into the team WeChat. Alternatively, email Stephen. Where/when As soon as the weather thaws out, the Beijing Bombers are out on the field training. Training is held every weekend either in the Chaoyang or Wudaokou area. Otherwise, the Beijing Bombers can be found at Caravan downing pints of beers while watching footy games. What The Beijing Celtic Football Club was created in 2002, and has since actively involved themselves in the Irish and international community of Beijing, playing good ol' FIFA football (aka soccer). With two teams playing for this season’s IFFC (International Friendship Football Club), they’re currently looking for players of all levels to join them. Who Currently a men’s team. How Interested? Send them a message here. Where/when Training is every Thursday, 6.30-8pm at Si'de Park, with matches on the weekends. What The Beijing Gaelic Athletic Association (GAA) is one of Beijing’s most established international sports clubs. They’ve participated in several Gaelic football and hurling competitions throughout China and Asia, and in 2015, their women’s team was crowned with the 'Football Plate' at the All-China Games in Hong Kong. But don’t be intimidated by their list of accolades. Deep down, they’re just a welcoming group of people with a love for hurling (and Gaelic football). Who Men's and women's teams are available. How If you’re interested in joining the team, simply send them a message on Facebook or on their website. When/where The team usually takes a break from training during the winter, but come spring, they’re playing hard on the field on Monday evenings, 8-10pm at Si'de Park. What The Beijing Rockets are an amateur football team. Founded in 2013, the Rockets became popular very quickly, winning several local tournaments and bringing back tonnes of plasticware for display in their trophy case. The Beijing Rockets features players from all continents (except Antarctica, which is still a work in progress). Who Currently a men’s team, the Rockets are looking to form a women’s team in the near future. But for now, male players of all nationalities and skill levels are welcome to try out for the team. How If interested, contact Jody (ID: jodymkoks) or Farhan (ID: Farhan-Alam) on WeChat, or simply join them on their weekly socials at The Local. When/where The Rockets train at Chaoyang Park every Thursday, 8pm. During the International Friendship Football Championship season (March-June), they participate in league games on the weekends which usually take place in Lido. What Priding themselves as Vikings of the Orient, the Beijing Vikings football team was founded by a Danish expat in 1996. Primarily made up of players from Viking strongholds, aka Denmark, Sweden, Norway and Finland, the Beijing Vikings have since proved a strong competitor in the International Friendship Football Championships (IFFC). Again, we're talking soccer-y football here. Who All the players are currently men, though it is not strictly a men’s team. The competition is high, so either gender should be prepared for the physicality of the league. How To become a Beijing Viking, simply send them an email. When/where The Beijing Vikings have no formal training sessions per se, but they play games held every Saturday and Sunday between 12-6pm at Si'de Park from September-December and March-June. Otherwise, they can be found at the team’s main turf, Joe’s Bar & Kitchen. What The Beijing International Ice Hockey (BIIH) league is a non-professional ice hockey organisation in Beijing made up of over 140 expatriates and Chinese nationals who share the same passion for the sport. The nine ice hockey leagues under BIIH compete year-round in various tournaments in and around Asia. Prominent teams include the Expos, the Hot Wings and the Beijing Fireballs (previously known as the Beijing Oilers). Who Men and women of all levels are welcome to join. How Send BIIH a message to register. They are also having a BIIH registration night on August 25, 3-7pm at XL Bar and Restaurant. When/where Training schedules differ from team to team, with practices held at the rink located at Quanfa Garden, Xiangjiang Bei Lu. What Beijing Lax is a lacrosse team founded in 2015. With a straightforward mission to promote the popular Western sport in China, it's since grown into a welcoming, diverse community of varying nationalities. Who Everyone can join, regardless of gender or skill level. Don't sweat it if you've never played lacrosse before, as beginners are taught game fundamentals, while veterans can have practices and play against other teams in tournaments. Beijing Lax also has equipment that's free for loan and ready to use during training. How Get in touch with the head coach Tom Lehmann on WeChat (ID: tflehmann), or contact them here. When/where Regular practices occur from March-October on Tuesdays, 8-10pm. Games are played every Saturday, 12-2pm at Chaoyang Park. What Beijing Hikers is a family-run business that’s been organising hikes and expeditions around Beijing and greater China since 2001. They promise a safe and hassle-free hiking experience. Who If you’re a frequent hiker, you might want to consider joining the club. For 300RMB a year, you are entitled to ten percent off all regular hikes in Beijing and a five percent discount on hikes in other provinces. Every hike earns you a stamp and once you get to ten, you'll receive a 350RMB hike voucher. How If you are interested in joining the club click here, but if you’re looking to just try out some hikes, head over to their website to check out all the details on upcoming hikes. When/where Hiking times and dates vary, though most occur on the weekends. What The Beijing Roller Derby club was formed in 2013 by Jay Latarche and Annie Migli, who met online through a mutual love of the sport. This full-contact sport, played by teams skating counter-clockwise around a track, is not only badass, but also incredibly exhilarating. Who Everyone is welcome to join, regardless of fitness level or gender, though you have to be 18 years and older to take part in the game. How Get in touch with the team through Facebook, send them an email or simply turn up to their weekly training and skate away. Don't fret if you don't own a pair of skates, they can be easily rented from the team. The club also has loan gear that's available for those in need. When/where Practices are every Sunday, 6-8pm at BSB in Shunyi. What Coined Beijing’s 'most social rugby team', the Beijing Aardvarks started in 1999 by a group of students and have since grown season by season. The Aardvarks' team values are being social, playing good rugby and, of course, drinking hard. Comprised mainly of young professionals and students, the Beijing Aardvarks are always looking for new mates to join them on the playing field. Who Men and women. From newbies to pros, everyone is welcome to join. How To join, get in touch via WeChat (women's team ID: mcsweeny12, men's team ID: CJBowman). When/where During rugby season, or from March-June and September-November. Training is held every Thursday, 8-10pm at the Olympic Sports Centre. Typically, the Aardvarks also gather at their favourite off-field burrow, Paddy O’Shea’s. What Beijing Devils is Beijing's oldest rugby club. Started in 1992, the Beijing Devils were formed on the basis of 'what could go wrong with a little bit of touch on a Saturday?' Since then, the Bejing Devils have competed in a wide range of local and international tournaments. Who Men and women (the She-Devils). How Email Steven to get involved. Where/when Training sessions are every Tuesday and Thursday, 8-9.30pm at Dulwich College Beijing, with a bus pick-up that leaves from Xindong Lu in Sanlitun at 7.15pm. What The Beijing Hash House Harriers, or HHH, is a social non-competitive running club. Aptly known as the 'drinking club with a running problem', participants can expect to fill their Saturday afternoons with running, sides of off-key singing and copious amounts of food and drink. Who Everyone is welcome to join in the hash, with each hash costing about 80RMB. Hashes are also run by volunteers, so if you feel like haring (organising a run) just contact the team. How Check their website for the latest information on their runs, follow them on WeChat (ID: gh_752f39dff93c) or just turn up on the day. Where/when Venues differ from hash to hash, though they meet before the runs for drink specials and food at their official hash bar, Paddy O’Shea’s. What Explore China by racing around the country. Started in 2010 by Swedish elite runner Linus Holmsater, Heyrunning has now amassed over 300 members, attracting Beijing-based runners of all levels. Who Runners of any kind are welcome to join in on the runs. How If you have any questions, send them an email, or even better, ask them directly during one of their weekly sessions. When/where If you’re looking for weekly runs, there are three different ones to consider joining: Urban Run, Park Run and Stamina. Runs take place on different days of the week at different venues, all focusing on different types of running, from long to short distances. What A highly competitive and spirited ultimate frisbee club that knows how to play hard, on and off the field. They hold regular practices all year round – apart from during the bitter winter months – and train hard in preparation for domestic and international tournaments that they participate in fairly regularly. Who Mixed team that’s open to players of all physiques, whether you’re a total expert at the field or a complete beginner. Training is said to be tough, so be prepared to work hard. How Find them on Facebook or send them an email to join. When/where Try-outs and training don’t start again until June or July, so your best bet is to send them a message to find out their training start times. What Founded in 2018, the Beijing Dragons are a mixed-level volleyball team. Initially formed to provide a space for like-minded women to come together and play the sport, the Dragons have since grown to become an inclusive sports team made up of both male and female players. The Dragons are fiery both on and off the court, currently competing in their second playing season and participating in social nights at their favourite dragon’s den, Paddy O’Shea’s. Who The Dragons are open to everyone. As long as you’ve got a good attitude and stay committed, there’s a place for you, regardless of your age, skill level or gender. Since the Dragons are working on growing more competitive, taking part in a try-out session – to experience the vigour of their training – is encouraged before pledging your commitment to playing the season. How Get in touch with Audrey via WeChat (ID: audreyduarte4) or Alex (ID: alexnaidoo200), or find them at their home turf of, you guessed it, Paddy O’Shea’s. When/where The Dragons train all year long either indoors or outdoors (if the weather permits). Training is held twice a week, on Monday evenings, 7-9pm at Beijing BISS International School, and Thursday or Friday evenings, 6.30-8.30pm at the University of International Business and Economics (UIBE). Games are played every Saturday afternoon against other teams at Harrow International School.